Many colleges and universities are now investing in more e-learning and blended learning courses. For a course to be worth the investment the institution must first recognize the most important factors to consider while developing the course. Of all the factors considered while developing a course the student must be considered as the most critical. This paper explores literature related to e-learning and blended learning environments. The literature presented will assist the reader to determine the important role of the learner in the success of e-learning and blended learning courses. This literature will conclude that student motivation is a major factor for e-learning and blended learning success. The results will also alert the reader that student success in this environment is heavily related to course layout and accessibility. This paper provides a summary of current research on the topics of e-learning and blended learning while also summing up the role of the learner. Shivetts, C. (2011). E-Learning and Blended Learning: The Importance of the Learner A Research Literature Review. 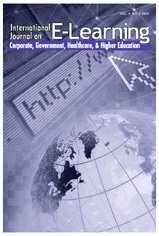 International Journal on E-Learning, 10 (3), 331-337. Waynesville, NC USA: Association for the Advancement of Computing in Education (AACE). Retrieved April 24, 2019 from https://www.learntechlib.org/primary/p/33111/.